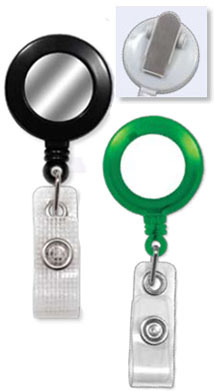 Solid-colored Plastic retractable badge reel in a round shape, with your choice of white or silver sticker already adhered. Slide type belt clip. The strap attachment (available in clear and reinforced vinyl) snaps into place to accommodate any slot-punched ID Card. Reel Diameter: 1.25 in (32mm). Cord length: 34 in. (864 mm). Please order in multiples of 100 reels per color.